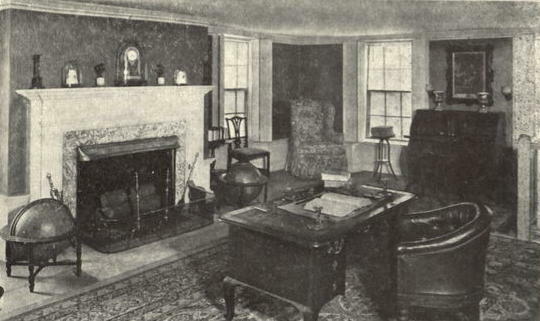 In upper- and middle-class homes across America at the turn of the last century, the man of the house had one room that was his exclusive domain: The study. 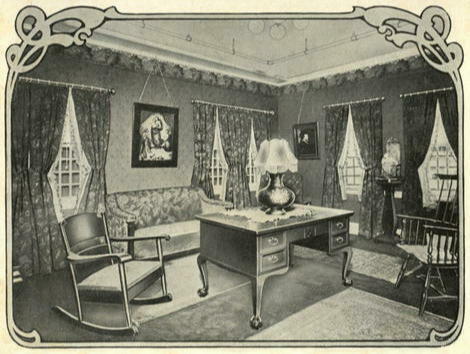 The study was a place where the man of the house took quiet refuge. 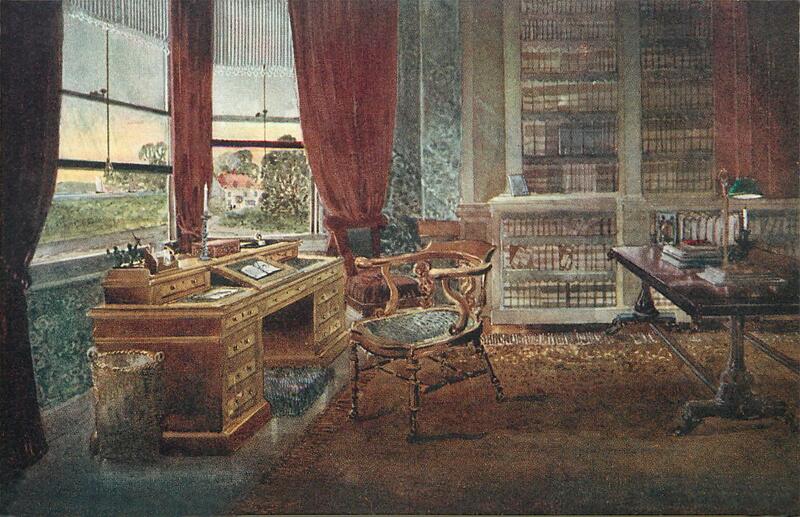 In his study he took care of business matters, wrote letters, or read his newspaper or favorite book in solitude. In some of Isabella’s books, like Jessie Wells, the local minister locked himself away in his study to work on his sermon or write letters to the members of his church. 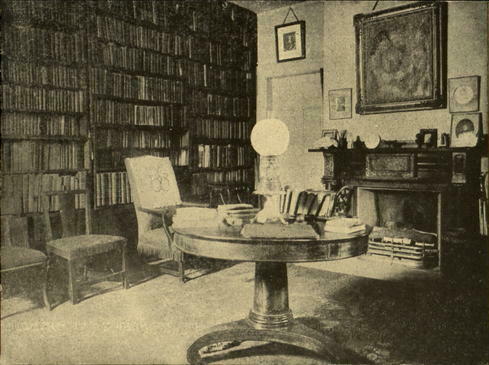 Another view of Emerson’s study. The walls were lined with many rows of well-filled shelves, and a searcher among them would hardly have failed of finding every choice book of the season, as well as the standard volumes of the past. A bookcase devoted to standard magazines was crowded almost to discomfort, and the large study table was strewn with the very latest in newspaper and magazine. The floor had a neat strip of rag carpeting over in the part which Daisy called “the study.” There was also a little square table over there, with the Bible on it, and Daisy’s geography, and Ben’s arithmetic, and a tiny basket that held Line’s crochet work. At first, Daisy had objected to the crochet work—that it did not belong to a study—but one evening, in the very middle of Miss Sutherland’s study table, what did she see but a fluffy ruffle with Miss Sutherland’s needle set in its hem, and her thimble lying beside it! Since that time the crochet basket had held peaceable possession. In the story Miss Sutherland lived in the big house on the hill; and since Daisy’s mother often did sewing for Miss Sutherland, Daisy had seen the Sutherland’s study when she delivered completed work to her. Daisy dreamed of one day living in a home with a real study, just like the Sutherland’s had, with plenty of books, and with framed mottoes on the walls. When Perry came back from the station, after seeing the party off, he shut himself up in the study, not seeing his wife until dinner-time. Then all traces of emotion had disappeared, and he was the affable gentleman exerting himself to be entertaining. Retailer Jordan Marsh advertisement for a suite of home furniture appropriate for a study or library. Because the study usually was the bastion of the man of the house, it was only natural that others did not find the place calming and comfortable. If a father had to scold a recalcitrant son or daughter, he called the child into his study. If a minister felt the need to counsel a wayward congregant, he did so in private in his study. Under those circumstances, the study became less like a quiet refuge and more like a place where wrong-doers were brought to account and punishments were doled out. That thought was uppermost in the minds of Eurie, Marion, Ruth, and Flossie in The Chautauqua Girls at Home when they had to summon their courage to visit their minister, Dr. Dennis, in his study. 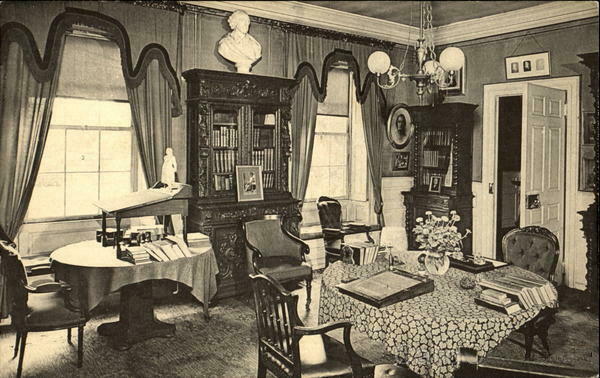 Early photo of the study at the Adams mansion in Quincy, Massachusetts. It was a place in which she felt as nearly embarrassed as she ever approached to that feeling. She had a specific purpose in calling, and words arranged wherewith to commence her topic; but they fled from her as if she had been a school girl instead of a finished young lady in society; and she answered the Doctor’s kind enquiries as to the health of her father and herself in an absent and constrained manner. 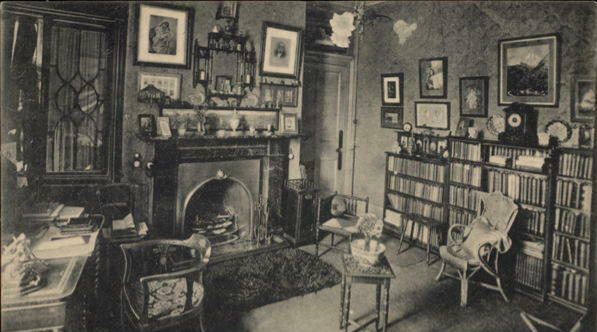 Charles Dickens’ study, about 1922. But in one of Isabella’s books, the tables were turned on the man of house. 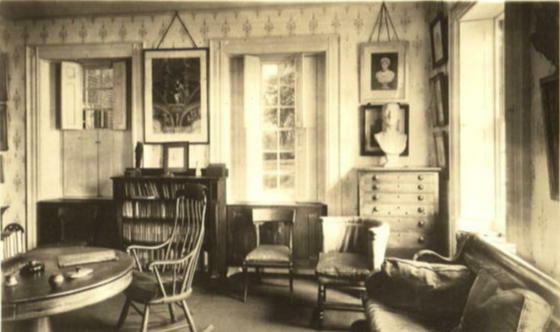 In The Hall in the Grove, Dr. Monteith—the driving force behind the town’s Chautauqua Literary and Scientific Circle—was in his study when Paul Adams complained to him that the Circle put more emphasis on studying books about ancient Rome than on studying the Bible. Dr. Monteith was shocked. You would have been sorry for Dr. Monteith, could you have seen his distressed face. He arose and began to walk back and forth in the little study, pondering how he could best undo what his heart told him had been grave mischief. Dr. Monteith knew that the Bible was “first, best, purest, highest; incomparably above any and all other books.” He had to do some quick soul searching to figure out how he had misled Paul Adams—as well as an entire Chautauqua Literary and Scientific Circle—so far away from the foundation of all knowledge, the Bible. Once Dr. Monteith realized his error, the atmosphere in his study changed dramatically. He apologized to Paul Adams and assured him that reading and knowing about the Bible was not the same as reading and knowing the Bible. And before Paul left his study, Dr. Monteith led the young man to make a momentous decision concerning his future and his soul. It was a very beautiful room, so crowded with books, and papers, and conveniences of all sorts, that you would have supposed its owner could have nothing to wish for, and must be a happy man. Yet on the morning about which I am telling you, he did not look in the least happy; on the contrary, if you had counted the wrinkles between his hair and his eyes, and could have seen the puckers around his lips, which were hidden by a heavy moustache, you would perhaps have called him cross; and you would not have been very far from the truth. Something had happened that morning which made him feel like being cross with everybody. Nevertheless, he knew it would have to be endured, for the train had been gone at least an hour. “Why didn’t you make a memorandum of it?” his wife asked, taking fine stitches in the ruffle she was making, and speaking in that calm , even tone which is sometimes really irritating to excited people. Nobody had told him that he was expected to do any such thing, but he spoke as sharply as though someone had, and walked the floor, and looked wrathful. Poor man! He had been sadly disappointed. Besides missing a very important bit of business by his forgetfulness, he had missed the sight of a friend whom he very much wanted to see. Now, his little daughter Almina was in the library annex, hidden from view by heavy curtains, but within distinct hearing; and if you could have seen her I am afraid you would have thought she acted very strangely. Instead of looking thoughtful and sympathetic over her father’s troubles she clasped her two pretty hands together and indulged in a series of happy little giggles. You see, she knew something which her father did not. In order to have you understand, I shall have to go back a few days. The father’s birthday was coming, and Almina knew it; I am not at all sure that the father did, for he was so busy a man that he forgot even that. And Almina had, with her own hand, written, and, what was much harder, addressed a letter all herself, to a certain “Mr. Frank Smith, Toledo, Iowa.” Truth compels me to state that she spoiled three envelopes before accomplishing it to her satisfaction. In the first one she made the letter F look so much like a T that it read like Mr. Trunk Smith, and she felt sure that would not do; and then, because she had visited once in Toledo, Ohio, and heard about it all her life, and had never heard of Toledo, Iowa, what did she do but write it out nicely on the second envelope—Toledo, Ohio. Of course that wouldn’t do. By this time she was nervous, and blotted the third one badly, but at last it was well done, and the letter was sent. On the very morning of which I write, there had come an answer to her letter, in the shape of a lovely business-like looking package, done up in heavy paper, and packed in burlap and excelsior, and when her eager fingers reached the treasure thus carefully guarded, it was the prettiest walnut affair, with a lock and key, and inside, a row of compartments bearing the names of the months and the dates; and so arranged that memoranda of what ought to be done, even weeks ahead, could be slipped in, and would remain out of sight until the morning of the day when they were needed, when they would drop into view, and beg to be looked at. Mamma promised to try, and she tried, and accomplished it. There was great fun in the pretty library the next morning. Papa admired the beautiful walnut box to even Almina’s satisfaction, and assured her that it was the most ingenious little creature he had seen in many a day, and he was sure it would save him much time and patience. And then he heard all about how she earned the money to buy it, and “wrote the letter her own self,” and “had it come by express to her own address;” and he called her a dear little woman of business, and kissed her as many times as he was years old. And all the time the important paper which was to be remembered the next morning without fail, was hiding behind its partition, biding its time. The next morning Almina had forgotten all about it, but at eleven o’clock her father came hurriedly into the music-room where she was practising, and stooped down and kissed her. A very happy little girl was Almina, then. 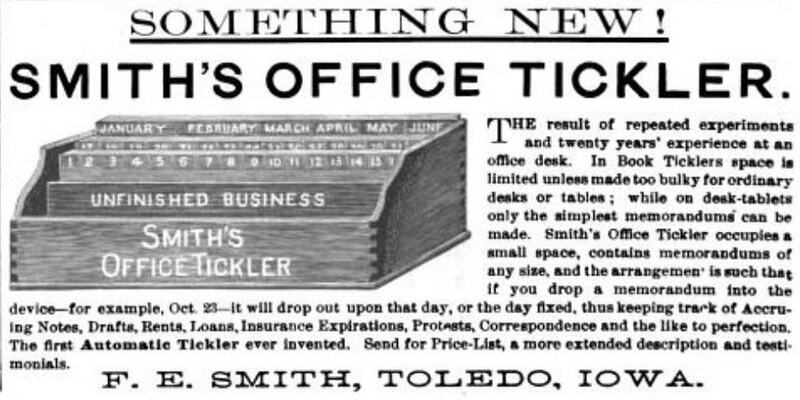 An actual 1887 newspaper advertisement for F. E. Smith’s Office Tickler. A very timely article, thanks. Just this week I was working on a book (Only a Dandelion-Elizabeth Prentiss) and the father in one story hadn’t invited the children into his study in quite a while. I thought that seemed harsh, but I see it was the norm. I’m glad my dad didn’t have a study! That automatic tickler looks very interesting. It’s intriguing that it drops a card on the correct day. I think it might beat an iphone reminder!